A good cup of tea can make the world of difference – be it mood, digestion or sleeping. This trio of loose teas, made from natural ingredients and nothing more, aim to do just that, one cup at a time. Each recipe makes a 200g glass jar – use approximately 1-2 tsp per cup of tea. Brew each blend in a teapot for around five minutes, then strain into a cup. Heat the oven to around 130°C/260°F/gas mark 1/2. Wash the ginger root and carefully peel off the skin. Roughly chop the ginger into small pieces. ‘pat the pieces dry with a paper towel, if needed, to remove any moisture before arranging on a tray with a paper towel, if needed, to remove any moisture before arranging on a tray with baking parchment. Finely slice the lemon peel and add it to the tray with the ginger and thyme. Pop in the oven, keeping the door slightly ajar. Bake for ten to 15 hours, checking occasionally to shake up the pieces. When the ginger is totally dried, remove from the oven. 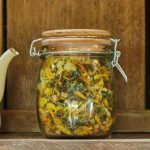 Mix the ginger, lemon peel and thyme together well and place in an air-tight container such as a Kilner jar. 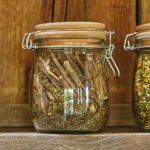 Break up the liquorice root to fit in your container, then pour in the crushed peppermint leaves to fill in the remaining gaps in the jar. 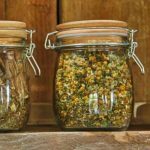 Mix the lemon balm and camomile flowers together in an air-tight container. If you are drying your own peppermint or lemon balm leaves, rinse each stem with its leaves in cold water and lay them out in a single layer on a paper towel to air-dry for a few hours. Then tightly tie the stems together in a bunch with string, leaving the leaves exposed. Hang the bunches upside down in a dark, warm, well-ventilated area for around two weeks.